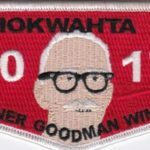 Ashokwahta Lodge #339 issued a set of two flaps to commemorate its winning the E. Urner Goodman Award issued by the Order of the Arrow each year. The award was earned for 2016 and presented in 2017. The E. Urner Goodman Award was established in 1969 as a tribute and testimonial to the Order’s founder, E. Urner Goodman. 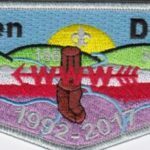 Its purpose is to encourage and challenge Order of the Arrow members and lodges to increase their effectiveness in promoting and increasing Scout camping in each council. Awards are presented to two outstanding lodges in each region annually. 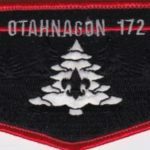 For a lodge to be eligible for consideration, the E. Urner Goodman Camping Award petition should be completed and forwarded with the lodge’s charter renewal application. Patchscan shows that 100 of the SMY border were issued. 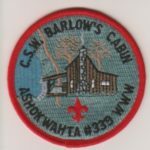 I have several more Ashokwahta Lodge #339 to post issued since the 2017 Jamboree, not sure if I am missing any. Please let me know if you are aware of any other issues.